In the Spring of 2013 I spent 12 days on a Holland America big-ship cruise in the Mediterranean Sea with my wife Monica and her sister and her mom. Opportunities for herping were few and brief: we mostly visited cultural sites, and mostly in tour groups with limited autonomy. We slept on the ship every night, and had to be back aboard well before dark, so there were no chances to see any nighttime critters. 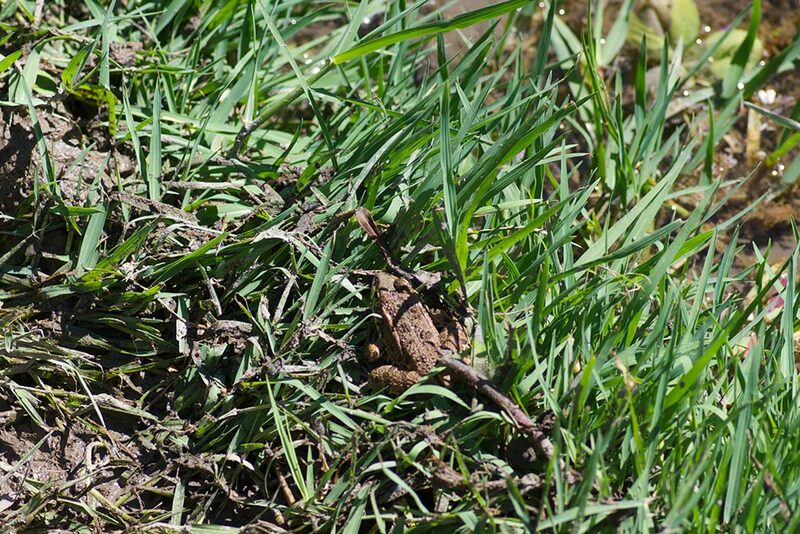 I had set my sights low; my goal was to see at least one herp on the trip. 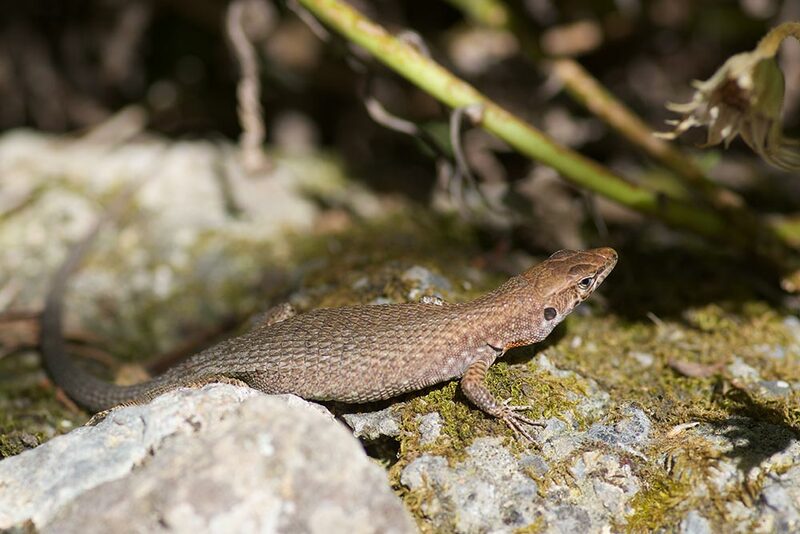 But I took what few opportunities I had and was pleasantly surprised to return with a list of 10 species, all new to me since I had never done any herping in Europe. Our first stop was Athens, Greece. I didn't see any herps in Athens proper, except for some turtles glimpsed at a distance at night in an artificial pond, which could very well have been red-eared sliders. 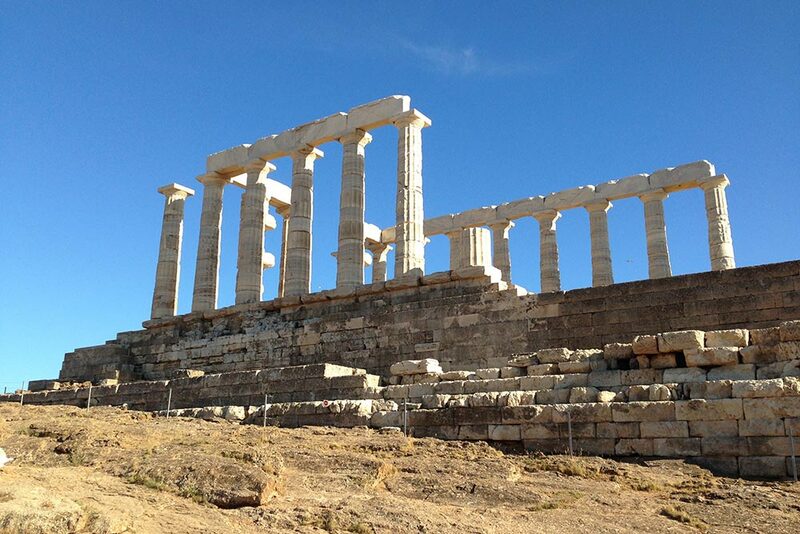 But one afternoon we drove about 40 miles to Cape Sounion to see the remains of the ancient Temple of Poseidon. 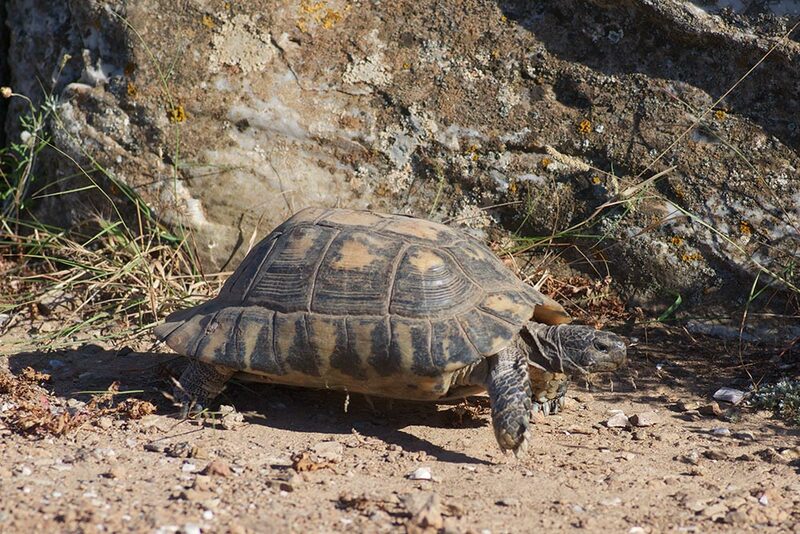 At the top of the short walk up the hill I turned my head to see a Marginated Tortoise (Testudo marginata) plodding along. 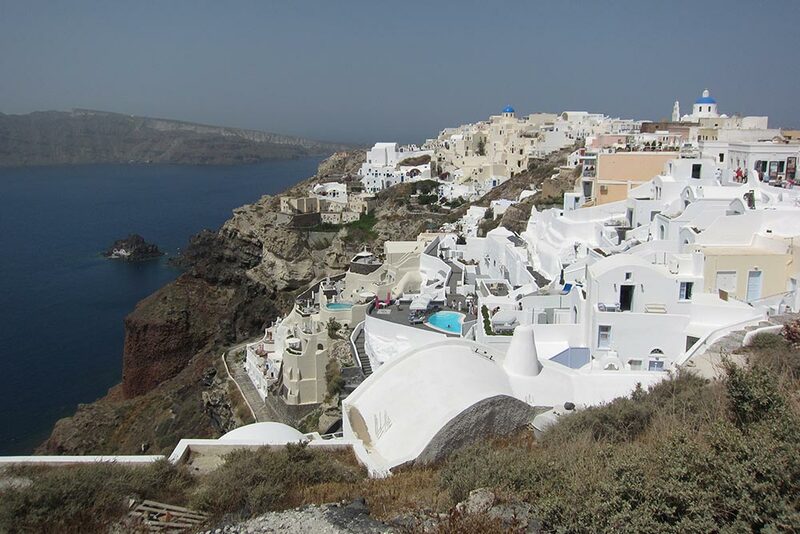 The next stop was the island of Thira, better known by the unofficial name of Santorini, which is apparently the most visited and most famous island in Greece. (Though not to me; the only Greek island I could have named before this trip was Corfu, about which more later.) The tour guide tried to explain why it is now so famous. I think I misunderstood or simply missed part of this explanation, but the short form that stuck in my head is "It used to be a large island, but most of it blew away in a huge volcanic explosion, so now it is adjacent to the world's largest caldera. Also, archaeologists found some really old ruins on it. 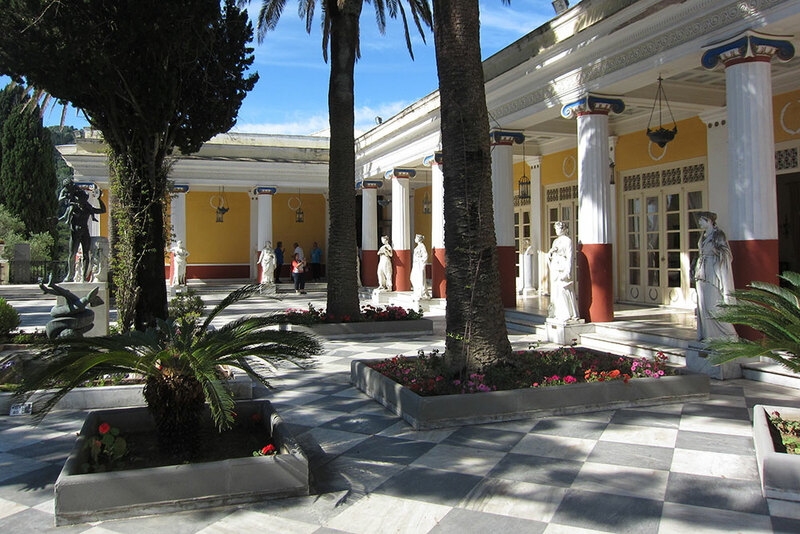 Also, all the buildings were demolished by an earthquake in 1956 and have since been rebuilt. Also, it has cool curvy white buildings built around the lumpy volcanic structure, and a thriving artist community." To me, that was not a clear explanation of why it is such a popular destination. Nonetheless, the curvy white buildings were cool. 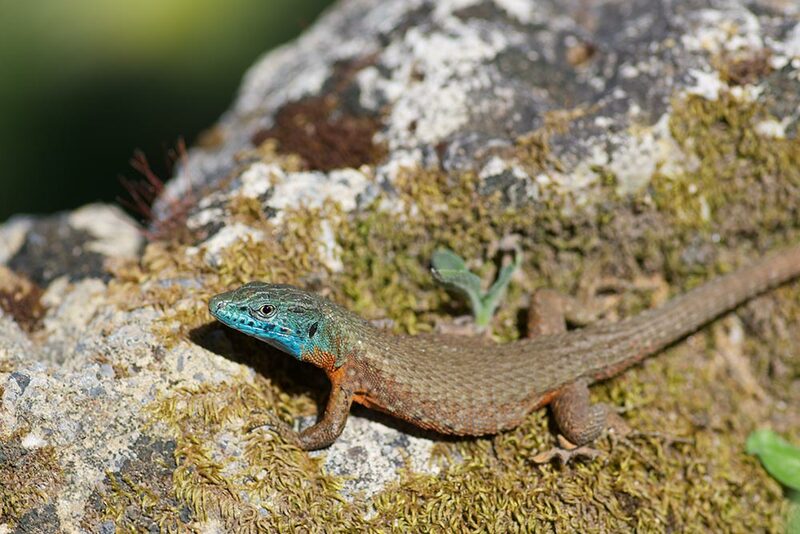 And it has one species of wall lizard, Erhard's Wall Lizard (Podarcis erhardii), a few of which I saw around town. From Katakolon we boarded a tour bus to drive inland to the site of the ancient Olympics, in a town named (you guessed it!) Olympia. 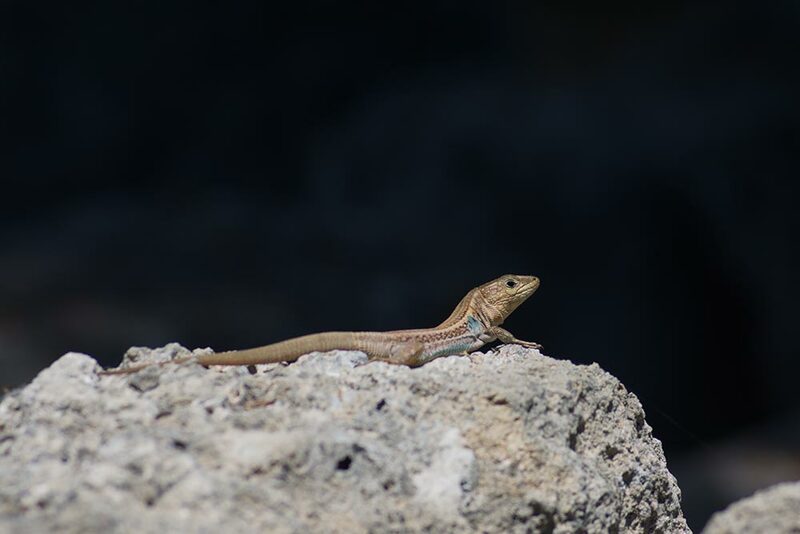 As our tour guide told tales of the naked athletes of old, I noticed Peloponnese Wall Lizards (Podarcis peloponnesiaca) perched on rocks and stone wall ruins. 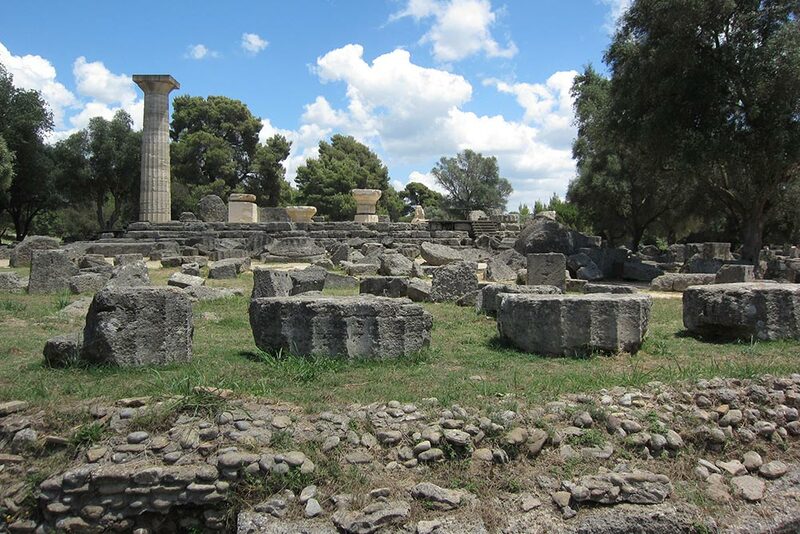 After the tour, while Monica and her family members finished some spanakopita and Mythos beer at a cafe just outside the entrance to Ancient Olympia, I had a fifteen-minute opportunity to look around. I found a walking path that paralleled a small stream, and saw a bunch of frogs jump into the water and disappear. With my remaining minutes of freedom ticking away, I finally spotted one of the frogs before it leapt away. 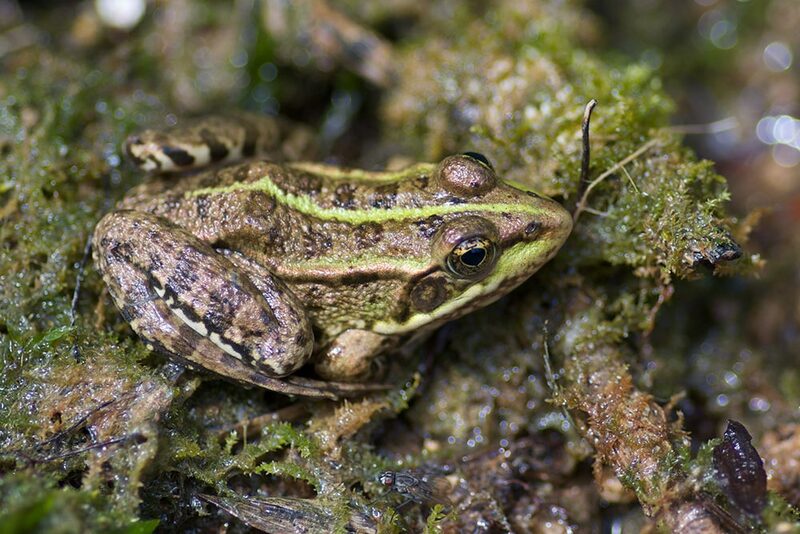 I guessed that this was a Balkan Stream Frog (Rana graeca), but krismunk suggested that it is more likely a Balkan Frog (Pelophylax kurtmuelleri), and I agree. 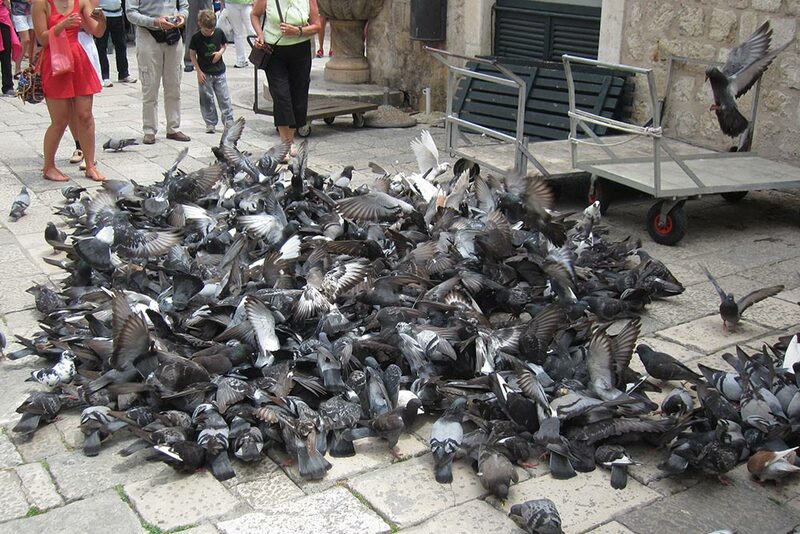 In two days in Venice, I did not scare up any herps at all. Next we visited Croatia for two days. 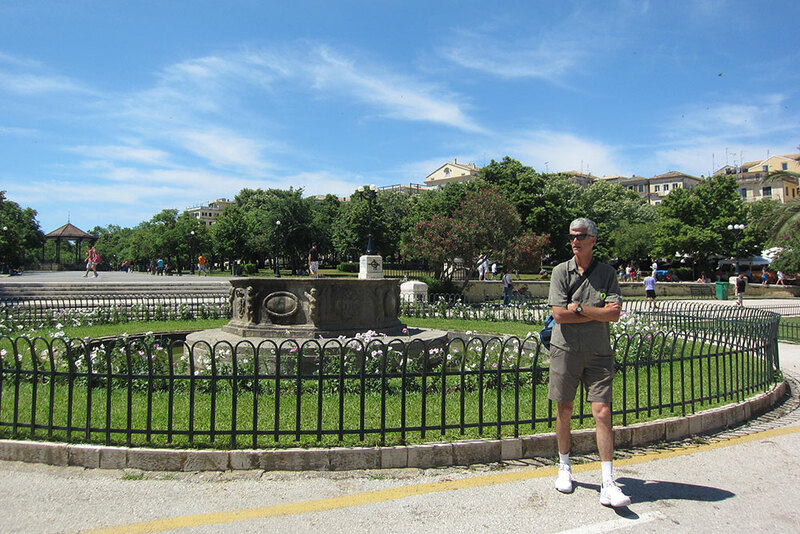 On the first day we docked at the city of Split, which has lots of history involving a Christian-oppressing early-retiring emperor of Rome named Diocletian. 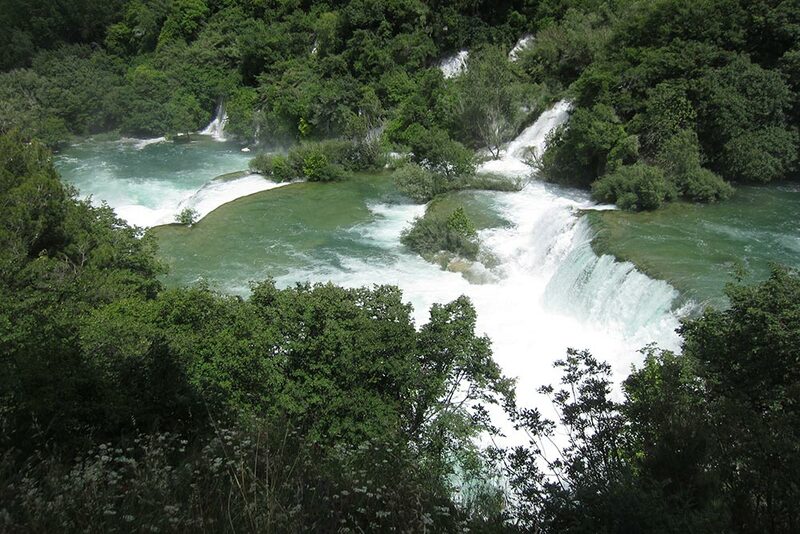 But we skipped all that to opt instead for a trip inland to visit the town of Sibenik (no herps encountered) and a beautiful park most known for its impressive waterfalls, Krka National Park. We had about an hour and a half to circumnavigate the main falls area on a network of paths and boardwalks along with hundreds of other people. I spotted a few Marsh Frogs (Pelophylax ridibundus, formerly Rana ridibunda) in and around shallow areas of relatively still water. Each time I stopped, I would attract a crowd of other tourists first trying to figure out what I was photographing and then taking their turns at photos. So these particular frogs are probably going to appear in dozens of iPhoto albums, Flickr sets, and scrapbooks. We returned to the bus about ten minutes before the deadline, and I took about eight of those precious minutes to check out a quiet little vegetated site along the water's edge that I had noticed when we had arrived. 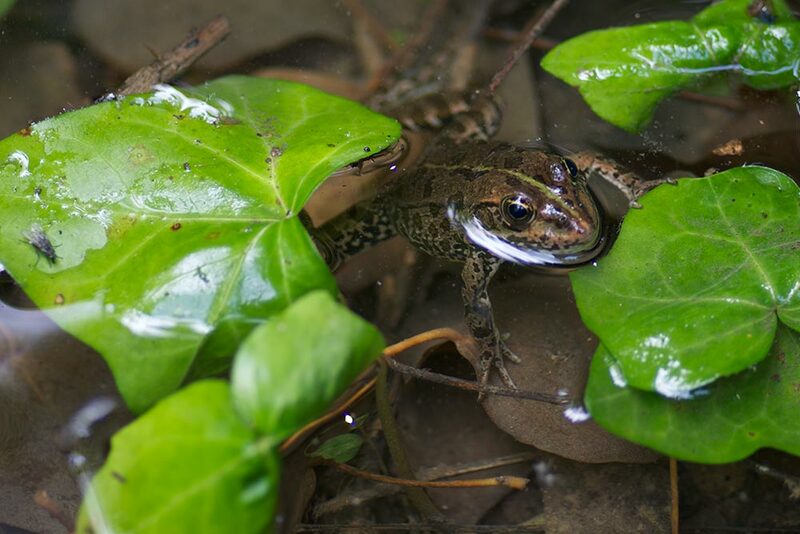 I spooked four or five more frogs into splashing out of sight before I saw a plain-colored, adult-garter-snake-sized serpent slither off into the water and lose itself in some semi-submerged vegetation. Thirty seconds later I had seen another similarly-sized one, and also a small one, but they too vanished within a couple of seconds of being sighted. 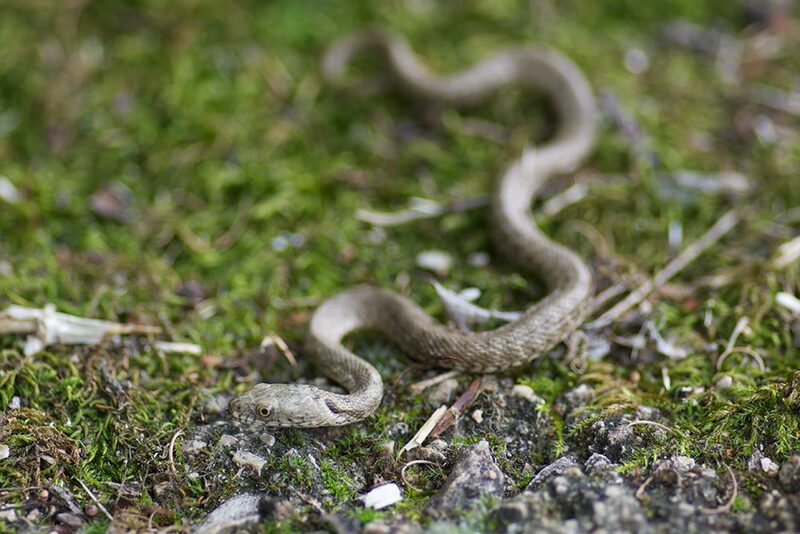 I was happy to have finally seen some European snakes, but a little bummed that I hadn't gotten any photos, when my eye caught the movement of a tiny snake still on land, heading toward the water that was a couple of feet away. I prefer in situ photos whenever possible, but I wasn't about to let this little guy reach the water and escape, so I gently picked it up and coerced it into holding a pose for a few seconds a little bit further from the watery freedom of which it was no doubt dreaming. This is a neonate Dice Snake (Natrix tesselata). The bus then took us to a restaurant near the entrance to Krka. 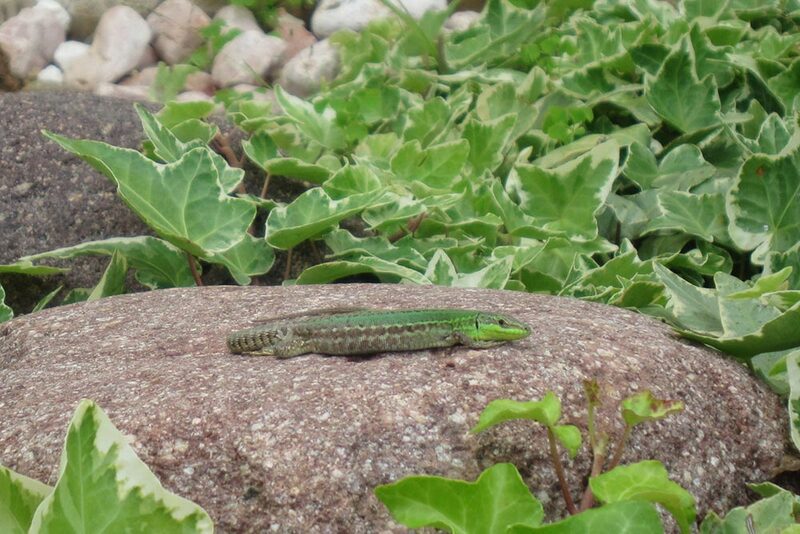 A small rock garden outside the restaurant was home to a few pretty green Italian Wall Lizards (Podarcis sicula campestris). After lunch I had a few minutes to poke around the outside of the restaurant before all the other tourists made their way back to the bus. I saw only one more lizard. At the time I thought it was a different species because its stripes were much more delineated and it lacked any prominent green coloration. But after later consulting my field guide, I concluded that it was probably a juvenile and/or female P. s. campestris after all. 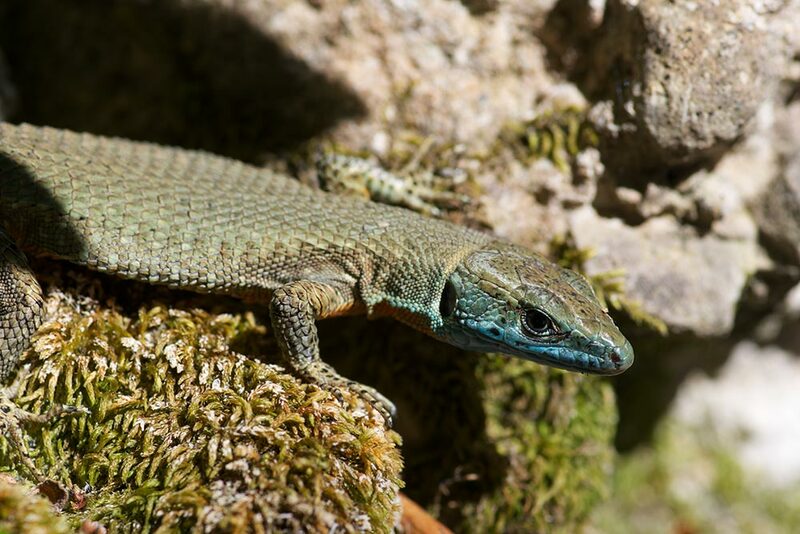 krismunk, who knows the European herps far better than I do, suggests that it might be a Dalmatian Wall Lizard (Podarcis melissellensis). 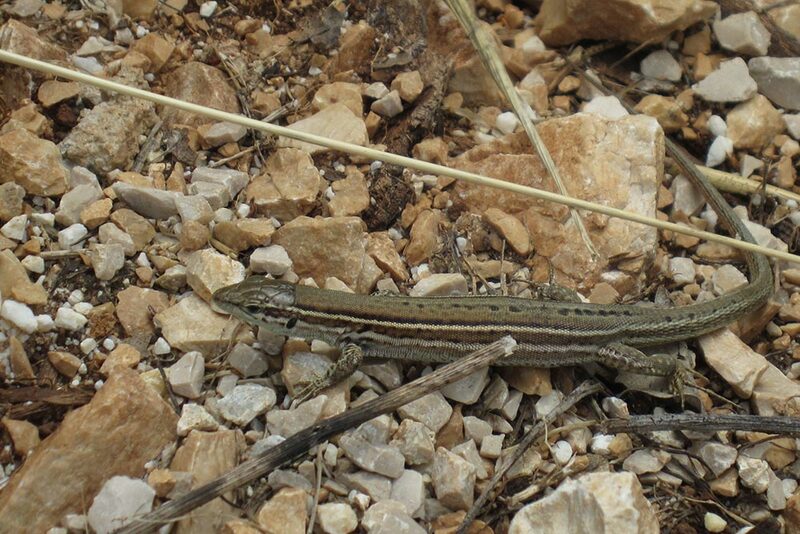 I asked on fieldherping.eu and people there agreed. 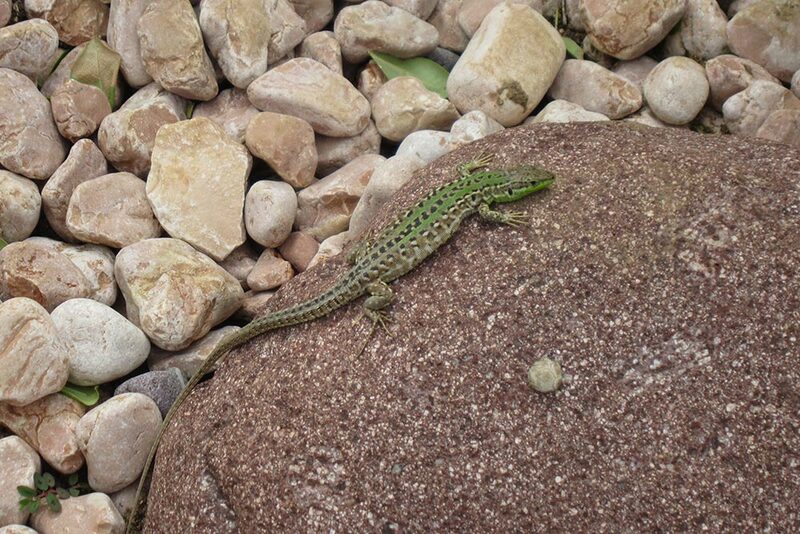 So I'm calling this one a Dalmatian Wall Lizard now. 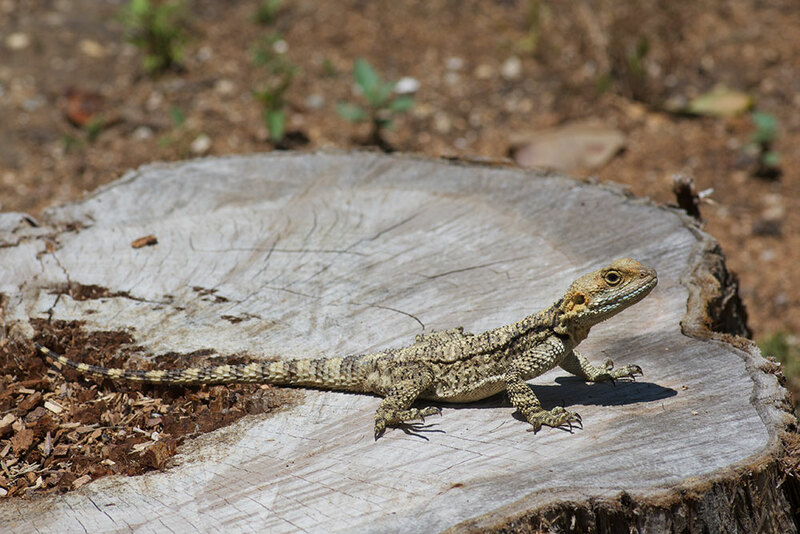 Apparently P. sicula is the more dominant species, and pushes P. melissellensis into less desirable habitat, akin to the situation in Florida with Anolis sagrei and Anolis carolinensis. The penultimate stop for our ship was at the Greek island of Kerkyra, better known as Corfu to the English-speaking world. "Corfu" is a magical word to me, as it means one thing and one thing only: it is where the great writer and conservationist Gerald Durrell spent his formative years, and thus is the setting of his first and finest book My Family and Other Animals. 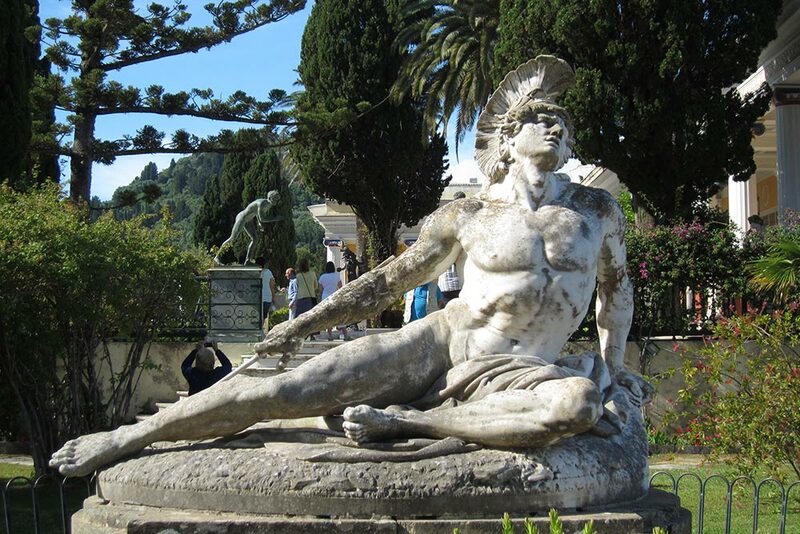 (Some of his other books contain more stories from his days on Corfu too.) If you have never read My Family and Other Animals then you should be reading that instead of this. No, really, go read it now. Come back here when you're done. 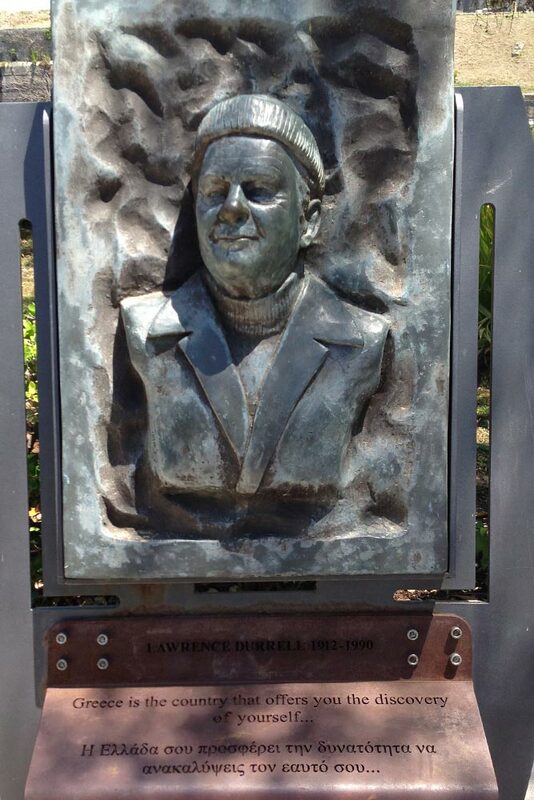 I was really hoping to see some sort of herp -- any sort of herp -- on Corfu, to honor the memory of the late Mr. Durrell. We started the day with a visit to the Achilleion, which is a palace that intentionally looks like something from ancient Greece but was actually built in 1890 by the grieving empress of Austria to honor her son who had the previous year scandalously killed his mistress and then himself in a murder-suicide pact whose repercussions eventually led to the assassination that kicked of World War I. (It seems that everywhere you turn in Europe, history looms.) 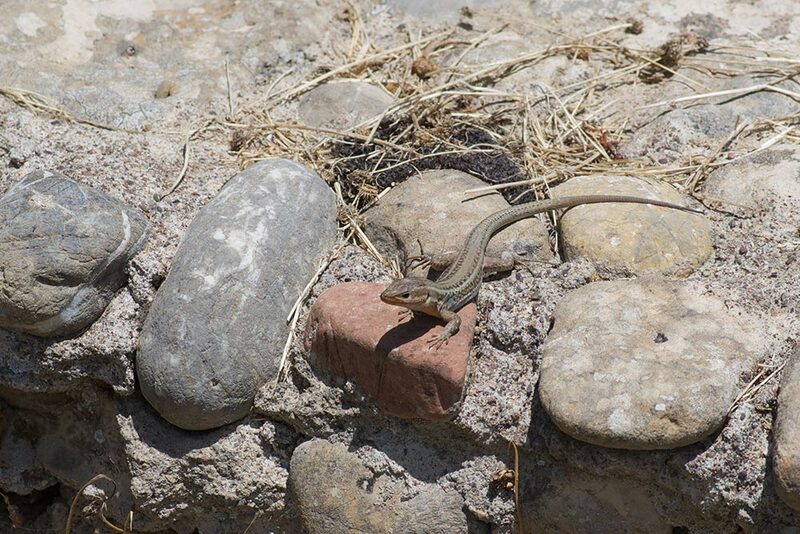 As we wandered the gardens of the Achilleion, I spied a few Blue-throated Keeled Lizards a.k.a. 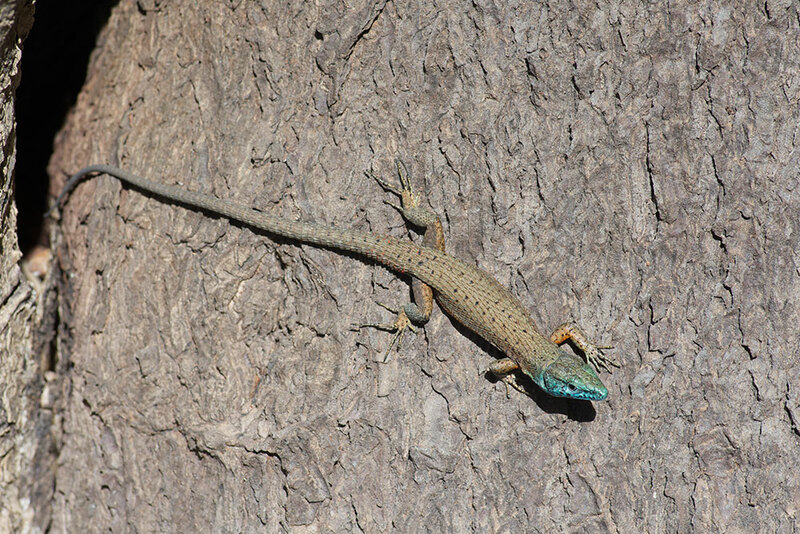 Dalmatian Algyroides (Algyroides nigropunctatus) warming up on rock walls and tree trunks in the morning sun. Yay! 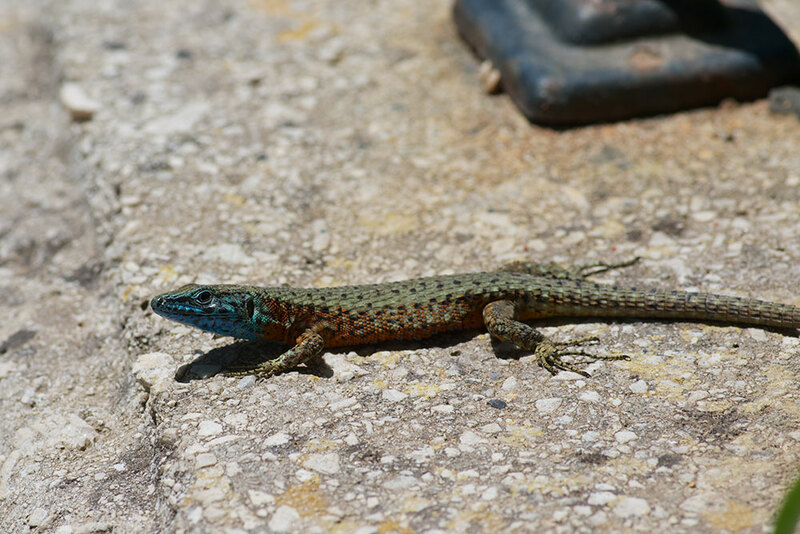 Herps from Corfu! If our cruise ship sank now, I would die happy. Then our tour group entered the building, where there was much art, and many, many people. I opted out of this part of the tour to further check out the grounds. 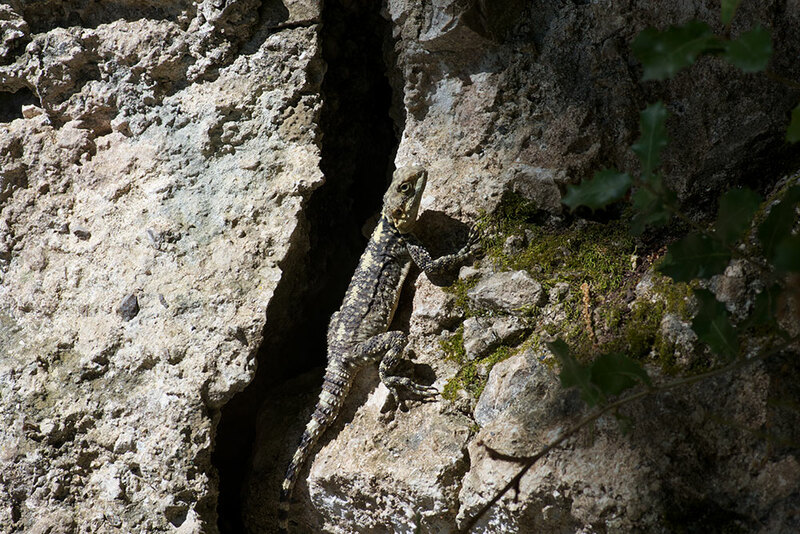 I soon spotted a large and robust agamid perched on a rock wall. 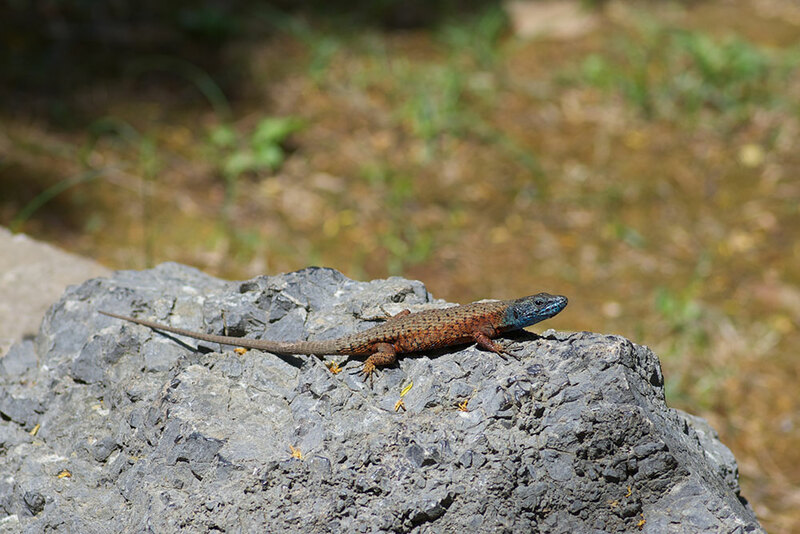 It was a Starred Agama (Stellagama (Laudakia) stellio), the only agamid species whose range reaches north to Europe. S. stellio is not native to Corfu though; it was apparently introduced there in about 1915. 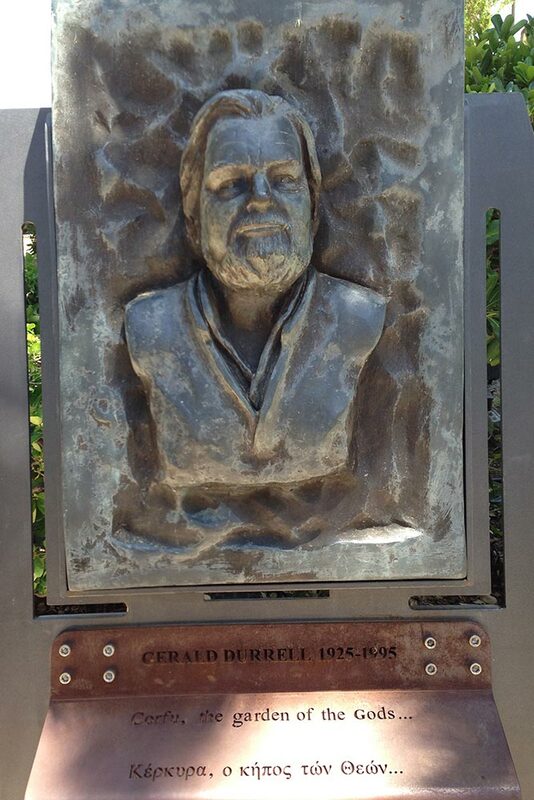 But that's still before Gerald Durrell was on Corfu, so that counts as native in my book. 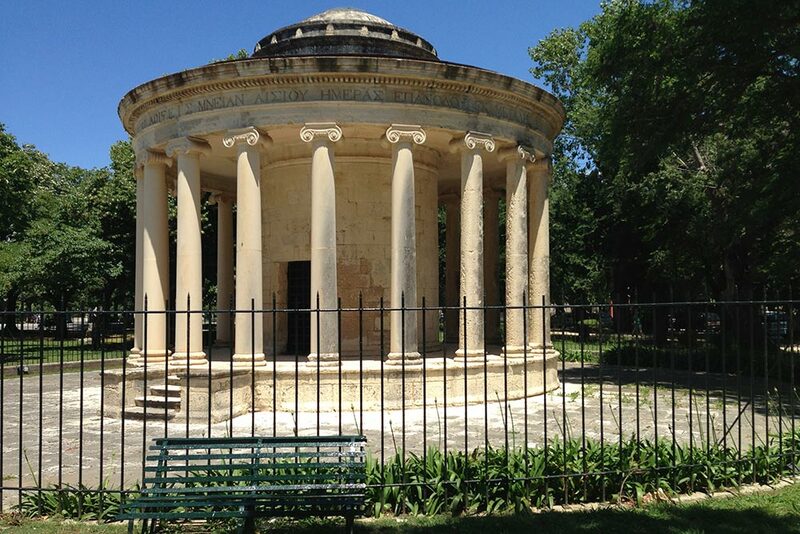 We next visited the Old Town of Corfu. Between the shoreline and the fortified town lies a grassy park called Esplanade Square. 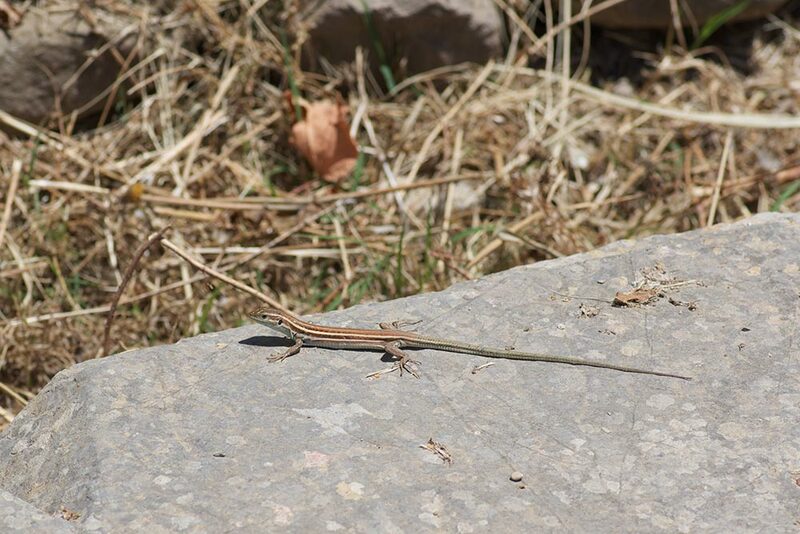 Our tour guide mentioned that there was a "big, rare lizard" that "only lived in this square". This latter claim seemed pretty dubious to me, but hey, I wasn't going to miss the opportunity to look for a lizard that our tour guide had specifically mentioned. So after a delicious lunch at an outdoor cafe, I split off from Monica and her family so that they could enjoy a leisurely extra beer and meander about Old Town while I did some public park herping, Corfu-style. 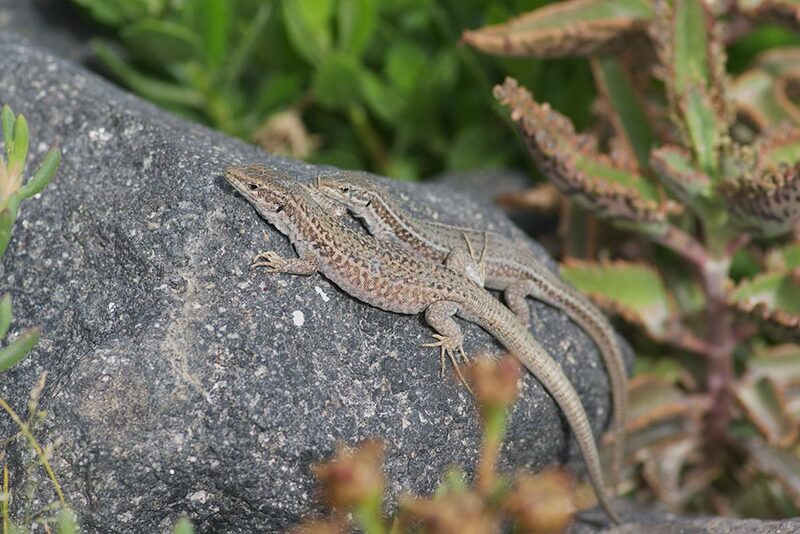 More Algyroides nigropunctatus scuttled about on rocks and pavement alike. You gotta love those blue heads. As you can guess if you've been paying attention, these were the same Stellagama stellio that I had seen earlier in the day at the Achilleion. So much for "only lived in this square". 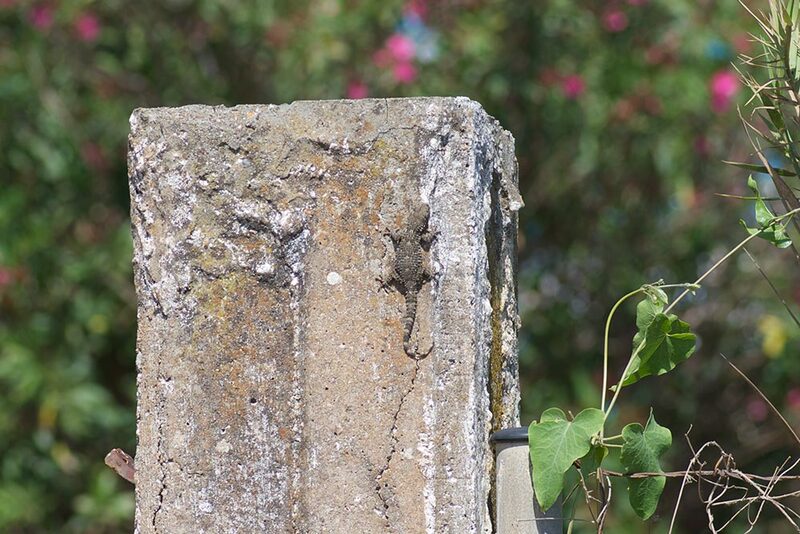 Ah well, they are still very fine lizards, and seeing them near a monument to Gerald Durrell was a very satisfying way to end the bits of herping that I squeezed into our cruise vacation. On our final day we went to Rome and Vatican City. These areas were tragically herp-free, if you don't count the snake in the Garden of Eden part of the ceiling of the Sistine Chapel.